FAYETTEVILLE, Ark. – The average disparity in per-pupil funding between traditional public schools and their public charter school counterparts in metropolitan areas is $5,721, a gap of 29 percent, according to a new report issued today by a team of researchers in the Department of Education Reform at the University of Arkansas. Funding from local sources is the chief reason for this disparity, representing a funding gap that favors district schools by, on average, $7,010 per pupil, or a difference of 74 percent. Local per-pupil funding for traditional public schools averages $9,534 compared to $2,524 for charter schools, according to the study. 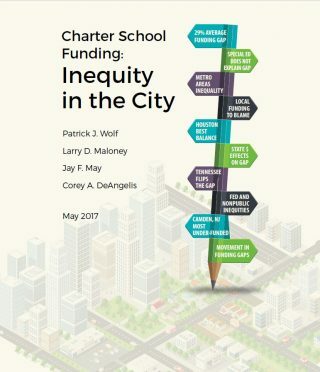 The study, “Charter School Funding: Inequity in the City,” examines all sources of revenue, including federal, state, local and nonpublic dollars during the 2013-14 school year, and focuses on 14 cities across the nation with a high concentration of enrollment in charter schools. Charter schools in 13 of those 14 cities received less money per student than traditional public schools; 12 of those cities had a funding gap greater than 10 percent. New Orleans also is included in the study but is treated as separately because of the special circumstances surrounding public school funding in the aftermath of Hurricane Katrina. Memphis was the only city examined where the disparity favored charter schools. Meanwhile, the cities with the greatest total funding disparity include Camden, New Jersey, at $14,771 per pupil; Washington, D.C., at $13,874; Oakland at $7,173; Los Angeles at $6,665; Indianapolis at $5,578; and Little Rock at $5,069. Local funding sources, including property and sales taxes, are the biggest contributors to the disparity. In seven of the cities examined — Boston, Houston, Indianapolis, Little Rock, Memphis, San Antonio and Tulsa — charter schools received zero local dollars compared to district schools, which received anywhere from $3,000 to more than $15,000 per pupil. Only in Camden, the city with the greatest overall funding discrepancy, did local officials allocate $326 more to each charter school student than to each traditional public school student. The five cities with the greatest local per-pupil funding disparity were Boston at $15,301; Atlanta at $8,313; Denver at $7,849; New York at $7,388; and Houston at $6,910. In the eight cities researchers at the University of Arkansas have studied since 2003, the funding gap has grown 79 percent, an increase of $2,605. The funding discrepancy has grown larger in five — in New York by 3,082 percent; Indianapolis by 1,148 percent; Washington, D.C., by 292 percent; Denver by 149 percent; and Los Angeles by 125 percent — and has declined in three — Houston by 129 percent; Atlanta by 64 percent; and Boston by 22 percent. During this time period and in absolute per-pupil dollars, the funding gap increased the greatest in Washington, D.C., by $11,740, followed by New York by $4,607, Indianapolis by $4,688, Los Angeles by $3,259, and Denver by $2,028. Federal funding sources also added to the current disparity, as students in charter schools received on average $624 less in per-pupil federal funds. Only Memphis and Houston have charter school sectors that received more federal funding than traditional public schools, slightly alleviating their respective funding inequities. Washington, D.C., has the highest charter school gap in federal funding, with charters receiving on average $6,572 per pupil less than traditional public schools. When looking solely at nonpublic funding, such as food service fees, individual donations, and grants from charitable organizations, charter schools in 10 of the 14 cities received slightly more nonpublic funding than traditional public schools. However, this only marginally alleviated the overall funding discrepancy for charters ($223 per pupil), since nonpublic revenue comprises only 6.1 percent of all charter school funding. Nearly two-thirds of public charter schools in these cities received no revenue at all from nonpublic sources. Even after accounting for special education expenditures, which are often cited as the reason traditional public schools receive greater funding, charters in 11 of 14 cities remain significantly underfunded. This year’s report is the first in a series of three studies to be released this year by the University of Arkansas team that looks at charter school funding. The second one will focus on funding in each of the boroughs in New York, and the final study will examine the return on investment between charter schools and traditional public schools, by comparing total dollars spent to student outcomes. In 2013, 2014 and 2015, the University of Arkansas’s Department of Education Reform looked at similar charter school funding discrepancy trends, each of which showed that public charter schools tend to receive far less money than traditional public schools. “Charter School Funding: Inequity in the City” is available at www.uaedreform.org/charter-school-funding-inequity-in-the-city.